The art of Anthony Clarkson is a portal into child-like innocence, mixed with troubled spirits, broken hearts and a sense of emptiness. 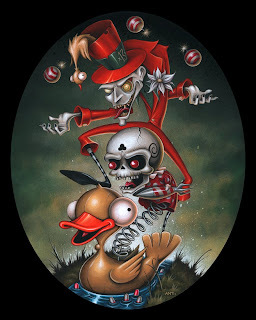 When Clarkson graduated from the Colorado Institute of Art in 2002, he was resolute in his decision to make a living as a graphic artist in the music industry. He was hired as the head graphic designer for a prominent record label in Los Angeles shortly thereafter. Embracing a vibrantly hyper realistic digital photo-manipulation technique, his first published album cover followed shortly after joining their ranks and quickly established a long list of published album covers for several bands on various labels. Inspired by the continuously evolving Los Angeles new contemporary art scene and growing weary with digital art, Clarkson began to revisit the drawing style of his youth, mixed with the feelings and dark emotions he has dealt with throughout his adult life. 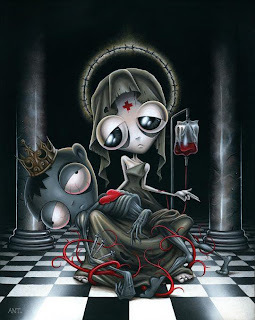 In late 2005 he was given the chance to be in his first group show at Thinkspace in Los Angeles, thus providing the perfect opportunity to begin showcasing a completely new direction in his artistic style. 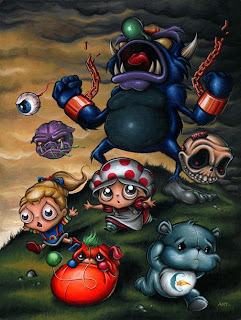 Clarkson’s art has been showcased in several galleries in the United States including Thinkspace, DvA Gallery, Gallery 1988, Cannibal Flower and Copro/Nason. Exhibitions of note include special curated exhibitions that were dedicated to Mattel/Hot Wheels, Marvel Comics (hosted by Stan Lee) and ‘Crazy for Cult 2’ (hosted by Kevin Smith). Clarkson was also featured in the ‘Intersections’ show at the Cypress College that took place during the spring of 2008. 1) Please talk a lil’ bit about the general idea/vibe behind your new series of works for ‘The Silent Treatment’. The title, ‘The Silent Treatment’ has partly to do with the way it sometimes takes silencing the world out before you can hear what you have to say. As far as the advertising and awareness campaign look, it is also a play off the name with my love for the look that old silent movies have. 2) Much of your new body of work revolves around lost loves / innocence lost – care to elaborate at all? For me, and I think most people, love is the one thing that can make you feel bigger than life, and truly euphoric. However it can also make you feel a bottomless pit of despair. In those moments, as gut wrenching as they are, I think you can find out things about yourself and the kind of person you are. In those moments you are forced to really look inside yourself. As for loss of innocence… I just notice how people as they get older seem to loose a spark to their spirit. It’s easy to say it’s because we have to live life in the “real world”, but I think there is more to it than that. As kids the world is an unending sea of possibilities, but as we get older we feel forced to compromise things, and then we start to except compromises too much to the point we loose that spark and just become hollow drones. 3) What’s your earliest memory involving art or creating art? I’ve never known life without art. It’s such a part of me I never thought “ok, I’m going to be an artist… this is my thing”. It was just always part of me. However I do remember I was maybe 6 or 7 and I made “life size” (remember I was 6 or 7) cutouts of all the Masters of the Universe characters and colored them. I then hung them all up in our basement and charged each member of my family 5 cents to come take a tour. I do remember at that point realizing I was a bit different than most kids. hahaha! 4) When are you most productive / when do you normally work on art? It really depends on just the mood I’m in. I feel most productive in the mornings, but tend to like to work at night. The night is just soooo much more quiet… and I like the dark, there’s a peace to it. 5) In addition to picking up steam on the gallery circuit, you’ve been approached by a number of toy companies in recent months. I know of the recent Disney custom show – please tell us a lil’ about that and anything else that can be discussed at this point. The Disney Stitch thing was really cool. I like doing things like that where it’s a special custom piece for a show, or designing something like a Dunny. As far as with any of my own toys, I’m going to be really picky. I’m very open to hearing ideas companies have for working with me, but I want to make sure they’re done how I would want them and not compromise my vision just to put a toy out there. 6) Do you listen to music while painting/drawing? If so, do you have a current favorite that inspires? Music is a HUGE part of my life. I either paint with music going or movies that I’ve seen a billion time so I can follow along without watching the screen. Usually I like to listen to more of an ambient dark soundscape kind of stuff when I paint. I always find myself returning to bands like The Cure, Diary of Dreams, The Sisters Of Mercy, Sigur Ros, Tori Amos, Anathema, Ulver, Switchblade Symphony, The Album Leaf. If I want something more abrasive I usually listen to something like Iron Maiden, Marilyn Manson, AFI, The Birthday Massacre, Nine Inch Nails, Paradise Lost… stuff like that. 7) If you had to explain your work to a stranger, how would you do so? I usually just say it’s just dark emotionally driven cartoonish stuff… followed by, “you just have to see it”. haha!! 8) Favorite artist (living or dead) and what makes them special to you? Michelangelo was my first love of a classic artist, more so his sculptures than his paintings. In fact, his sculpture of the Pieta’ is maybe my favorite piece of art ever and was the inspiration for the main piece used in the awareness campaign for ‘The Silent Treatment’ show called “Together Through Sick and Thin”. I just love the silent passion of it. So much is said with almost no movement to it. Plus parts of the stone flow like water and that just blows me away. 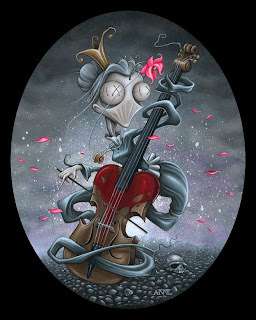 More modern artist that influence me are definitely Mark Ryden, Michael Hussar, Greg “Craola” Simpkins, and Dave McKean. 9) What have you got coming up in terms of shows and projects after “The Silent Treatment”? I’ll have one or two pieces at the ‘Idiot Box’ show on April 2nd at Gallery 1988 LA, then I have a show up at Gallery 1988 SF along with 9 others later in the month of April Past that, things are still coming together. 10) You’re releasing your first print in conjunction with this exhibit. 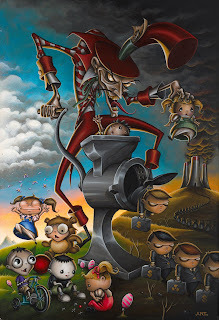 Can you tell us a lil’ bit of the back story behind “The Organ Grinder” piece? It was a commissioned piece, but the buyer gave me total creative control. It was an idea I’ve had for a long time. Maybe one of my more outward social comments as opposed to the more internalized emotional works. But I just wanted to make a pretty blunt comment on the “rolls” that we are suppose to play and how we are put in them and blindly accept it without questioning if that is what we really want for ourselves.